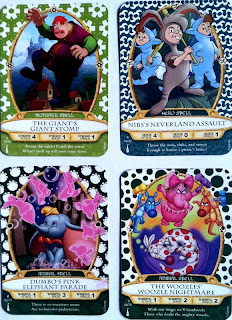 This Sunday I got to test Disney’s newest activity in Walt Disney World, the Sorcerers of the Magic Kingdom game. Before we get into this, I do want say that except for 4 years while I was active duty military, I’ve lived in the shadow of the mouse’s house since I was 8 years old. 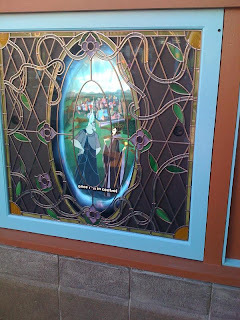 I can be very jaded when it comes to the Magic Kingdom. This will also be a pretty in depth write up, because I have a lot to say about this new game. It all starts when you enter the park onto Main Street. 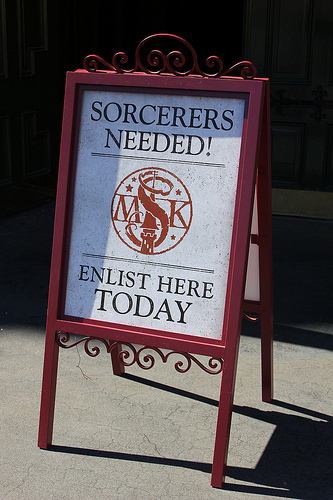 If you look over to the firehouse you’ll see a sign saying, “Sorcerers needed! Enlist here today.” When you enter there are helpful cast members who are there to get you started. A swipe of your ticket will get you 5 spell cards and 1 key card. At this moment this is the only way to get cards. Anyone with a ticket can request cards though, so make sure everyone in your party gets some. The reason they swipe your ticket into a reader is to make sure you are only getting 5 cards a day. After you get your cards you’re given a short training session that describes how to play and the premise of th game. Hades is trying to capture a crystal that he can use to take over the Magic Kingdom. 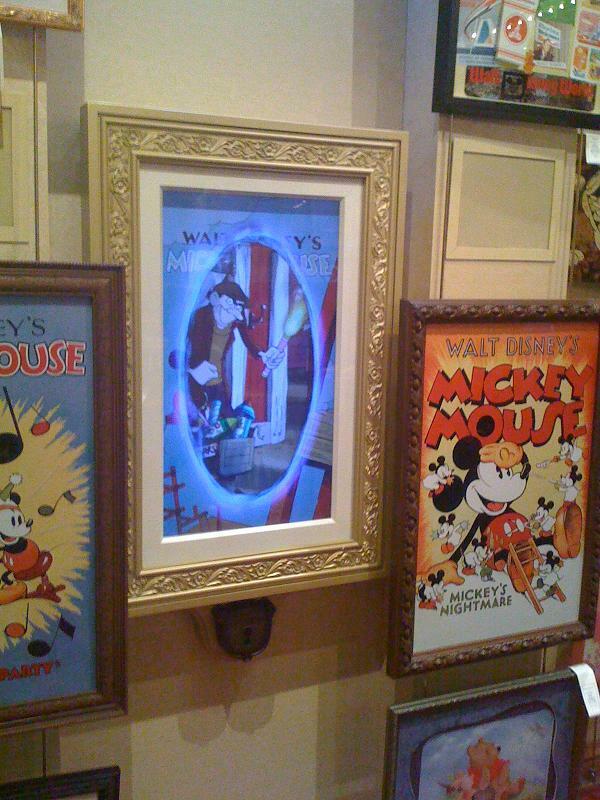 The crystal is broken and he is enlisting the other Disney villains to help him get the crystal fragments back. Merlin is enlisting you to stop him. You’re given a brief run down on how the game works, handed a map, and then the video shows you a symbol telling you that is where the next portal will open up. 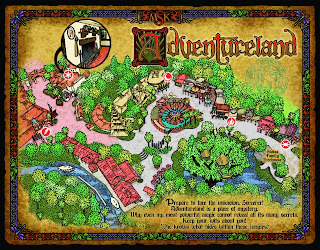 The map you are given is divided up into four sections; Main Street, Adventureland, Liberty Square, and Fantasyland. The different portal videos will always end with a symbol, letting you know where to go to next. 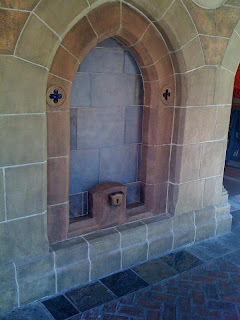 For the most part the symbols are located away from attractions so you won’t interfere with any of the ride lines. You’ll know you’re in the right spot because you’ll see a large lock with a keyhole in it. 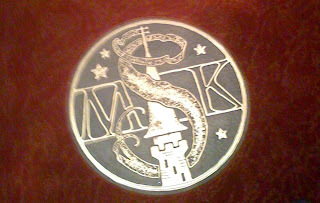 There will also be the Sorcerers seal on the ground. When you put your key card against the lock the portal comes to life. The portals themselves are very well done. 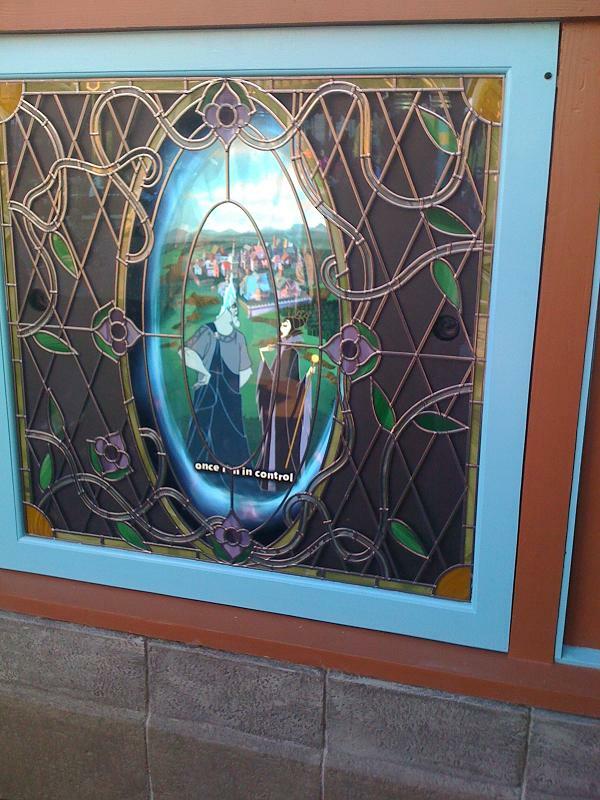 They may be hidden in picture frame, in a stained glass window, or even just an empty space of wall. The videos that the portals play are subtitled; that might not seem important but once you’re in the middle of a battle and the parade starts behind you, you’ll be glad you can read what is going on. During the videos you’ll be prompted to use your spell cards. There are two hidden cameras at each portal, so when you hold up a card it can tell which one you are using. Different cards cause different effects to fly at your enemies when you attack them. Sometimes you’ll be prompted to use your Sorcerer Crest, which means to show the back of any card. The camera setup is why there is a Sorcerer symbol on the ground. Standing on it will help them catch the card you are holding. You may still have to move the card up and down for it to trigger though. If you hold up more than one card, the results combine. For example I held up a Lumiere and a Frozone card. A blast of ice shot up the middle of the screen, and then a candle appeared over it and shot fire over the ice. 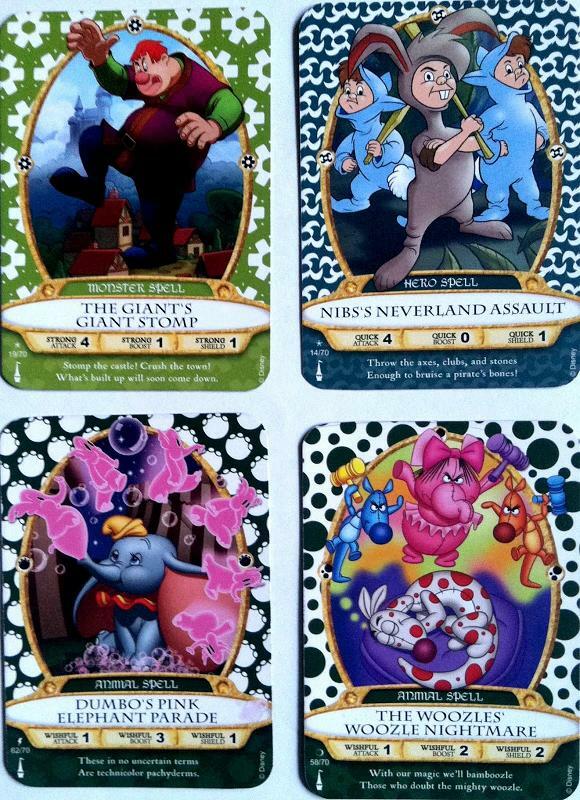 The cards are very nice and come with a ton of information on them. First it has a spell type, things like animal or hero spells. Below the name are three numbers; so it has an attack value, boot value, and a shield value. These values also have another identifier like Charming, Gross, Energy, Quick, etc… In the testing phase everyone is playing at the lowest difficulty. When the portal tells you to use an attack card, it doesn’t matter which one it uses. At higher difficulties these types and values will come into play. Currently there are 70 cards. Each round of the game will pit you against one villain. The general set up is the first portal will show you Hades recruiting a new villain, then through the next four portals you will battle that villain and assorted minions. At the end you’ll have reclaimed one of the crystal fragments and be given a new location if you want to continue. The rounds stay in an area, so you if your first portal is in Main Street all the other portals during that round will be in Main Street also. Considering all the expansion going on right now, this could be easily expanded to other areas of the park. To complete the game we were told that you would have to complete 8 rounds. We completed 5 rounds; 1 in Main Street, 1 in Liberty Square, 1 in Adventureland, and 2 in Fantasyland. Here is the greatest thing about the game, the day we were there the pack was packed. Lines were out of control, even for Disney. I spent over 5 hours in the park and had a great time. We spent the whole day playing the game and it was completely stress free. I honestly can’t wait for the harder version of the game to come out. I want more cards. 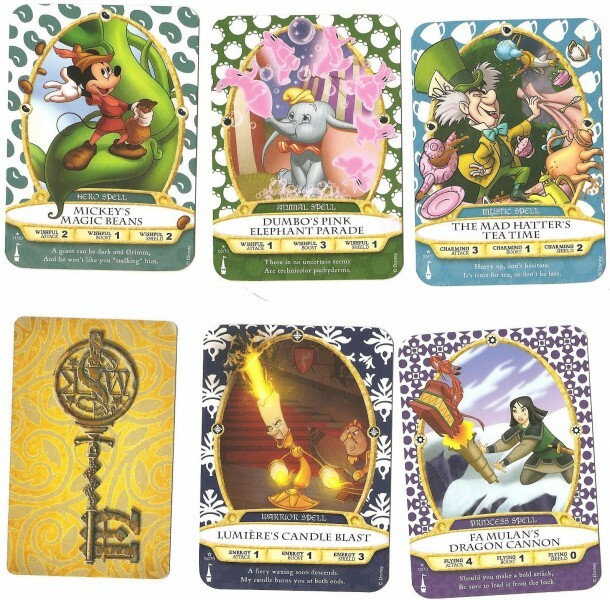 I’m sure Disney will eventually start selling booster packs and I’ll probably buy some. If you are headed to the park for the first time, ignore the game. Go check out everything else, trust me you’ll be busy enough. 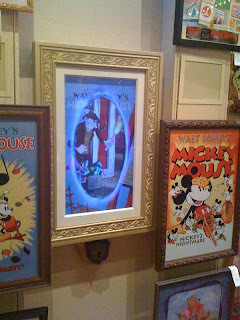 If you’re a local or have already seen everything Disney has to offer multiple times over, check out Sorcerers of the Magic Kingdom. I don’t think you’ll be disappointed. Having had maybe a little too much fun with the kim possible game at epcot, I am ridiculously excited to waste a day on this.